Dianna Derigo is a doctoral student of occupational therapy at Washington University School of Medicine. Dr. Duana Russell-Thomas is the Clinical Specialist at Washington University Program in Occupational Therapy. Dr. Christine Berg is the editor for this project. She is on faculty at the Washington University Program in Occupational Therapy with a focus on community-based teaching and learning. Regardless of the current treatment diagnosis, how many of your clients have experienced a traumatic event such as physical or emotional abuse, bullying, natural disaster, military trauma or chronic medical condition at some point in their lives? 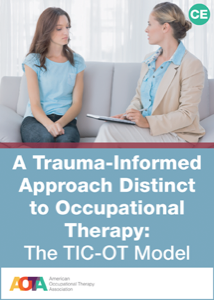 If you can identify at least one person who has experienced trauma then you, as an OT practitioner, must understand the impact that it can have on occupational participation for years following the event. The effects of trauma have been identified as one of the largest health crises facing society today. Research has shown that all forms of trauma, such as child abuse and neglect, create biological changes in the individual which can impact daily functioning and lead to issues with trust, a lack of developmental progress, difficulties with attention, memory and problem solving, impaired social skills, and difficulties with emotional regulation (SAMHSA, 2014). Trauma has also been linked to chronic conditions developing later in life such as liver disease, heart disease, chronic lung disease, cancer, obesity, depression, substance abuse, and suicidal ideation. This interactive introductory course defines trauma, its causes and sequelae, and offers a model for occupational therapy practitioners to use when working with those whose lives and occupational participation have been adversely impacted in some way by a traumatic event.